As a provider of Radio Frequency Identification (RFID) development services, Fraunhofer IPMS experts will be showing their complete range of services for the implementation of customer-specific RFID sensor solutions at the 2018 SPS IPC Drives. There are many application scenarios and convincing arguments for the use of RFID sensors in industrial environments. Passive RFID sensors measure and transmit all kinds of physical quantities with no contact whatsoever and without their own power supply. Maintenance-free with a virtually unlimited service life, RFID sensors can also be installed inaccessible areas. Unfortunately, commercially-available RFID tags and readers rarely immediately fit in cases of special applications. RFID sensor system requirements can vary greatly, depending on antenna shape, sensor positioning, environmental conditions, and application scenarios as well as existing IT infrastructure. 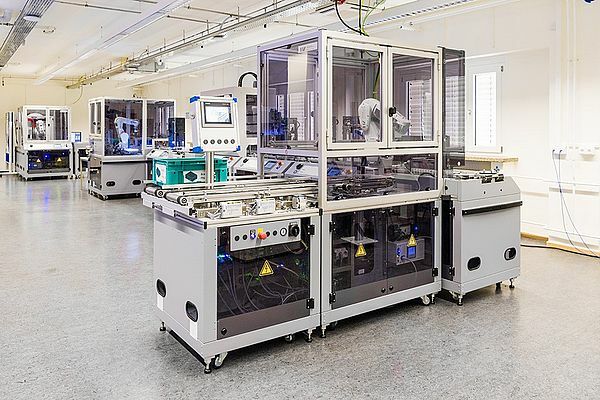 In the HTW Dresden IIoT Test Bed, suppliers, equipment manufacturers and systems integrators can replicate realistic and detailed partially-automated production and logistics processes. Using the production-related test environment, production processes required particularly for SMEs are implemented for the realization of an intelligent manufacturing landscape. Modular and flexible insertable stations make it possible to develop one's own modules and demonstrators and carry out Industry 4.0 relevant projects. For this purpose, access to a production logistics line with robot cells and modular stations is available to users. State-of-the-art sensors provide process and consumption data, environmental parameters, and process-related quality information. Fraunhofer IPMS services are completed with quarterly, all-day training. Developers will present an RFID evaluation kit equipped with various sensors and provide advice on the implementation of RFID sensor systems at the 2018 SPS IPC Drives.